The Food Alphabet and More: 3 Spectacularly Delicious Treats from McDonald’s This Holiday Season! 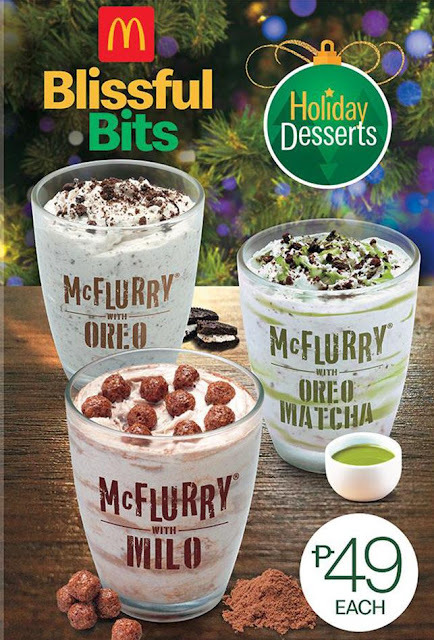 3 Spectacularly Delicious Treats from McDonald’s This Holiday Season! Holidays are all about cherishing special moments with family and friends and enjoying the comfort of your fruits of labor after a great year. McDonald’s makes every moment more special and meaningful this holiday season with not just one, but three exciting treats for every kind of craving! Chicken McNuggets fans are in for a treat this holiday season as McDonald’s introduces two new sauce flavors, as alternatives to their favorite BBQ and Sweet & Sour sauces. 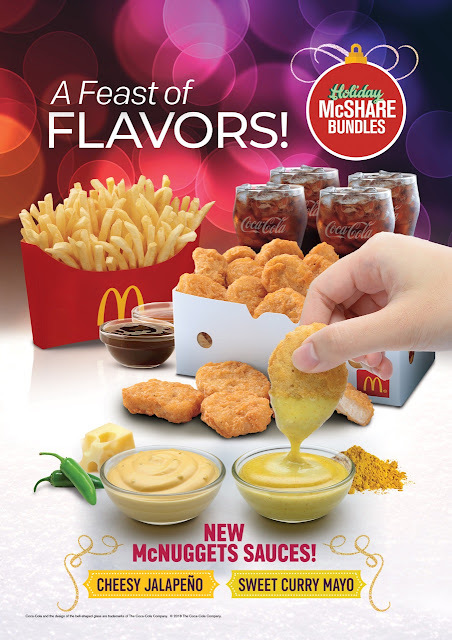 Get ready to dip your crunchy yet tender McNuggets in the new Cheesy Jalapeño and Sweet Curry Mayo sauces! Looking for a bit of spice tendered by the creamy saltiness of cheese? Cheesy Jalapeño will be your dip! For a more tangy burst of flavor with a twist, then Sweet Curry Mayo will be for you. Schedule that next McDonald’s trip soon or get it via McDelivery since it’s available for a limited time only! Enjoy these exciting new McNuggets sauces on your own as a value meal, or with friends and family as a box of 20, paired with McDonald’s World Famous Fries and drinks. And since the holiday season is all about sharing, celebrate with a McNuggets McShare Bundle dipped in the new Cheesy Jalapeño and Sweet Curry Mayo sauces in your next Christmas get-together! It’s finally here! This holiday season, treat yourself with the much-awaited McFlurry with Milo! Indulge in this dessert featuring McDonald’s perfectly blended creamy soft-serve mixed with Milo’s malty chocolate-y goodness. It’s a busy time this holiday season with all the gift-buying and last-minute shopping for friends and family. But don’t forget to indulge yourself even while on the go with McDonald’s Sundae Your Way, available in all McDonald’s Sundae & McFloat Stations! It’s a super sweet treat for you as Sundae Your Way comes with new mouth-watering syrups - Hazelnut Brownie, Cookie Dough, and Buttercream. 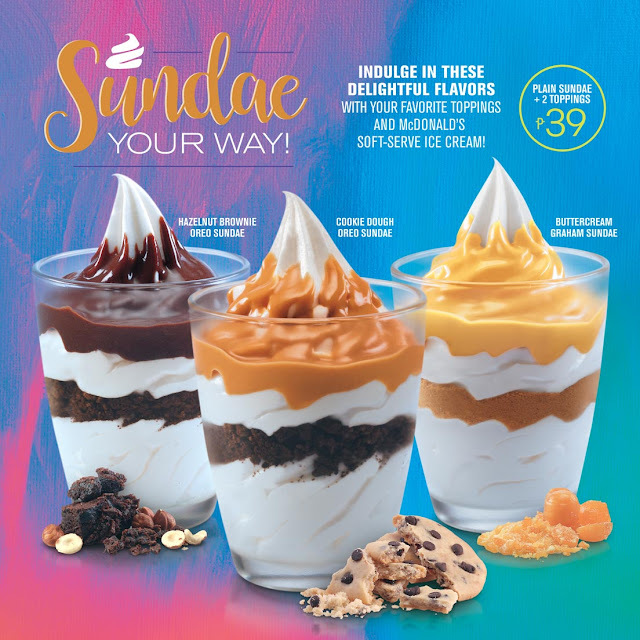 With these three new flavors, you can now mix and match a total of nine toppings with soft serve ice cream to create your perfect sundae! It’s definitely a celebration of new flavors at McDonald’s with all the holiday treats in store for you, your friends, and your family! You can share your holiday experience by tagging @McDo_PH on Twitter and Instagram. For more information on McDonald’s holiday offers, visit mcdonalds.com.ph or follow McDonald’s Philippines’ Facebook page, facebook.com/McDo.ph.